The three teens who traveled to and fundraised for projects in Haiti. A special event benefiting ACF and the Haiti Earthquake victims. Take the opportunity to care for Abused Children around the world by making ACF and the abused children of the world the beneficiary of your next celebration! Birthday parties, Christmas cards, Graduation letters or even special fundraisers can all inspire and motivate your friends and loved ones to provide for the neglected and abused children all over the world!" Recently four teens, inspired by the devastating earthquake that hit Haiti, threw a fundraising event benefiting Aid For Abused Children Inc. and the work we are doing in Haiti. 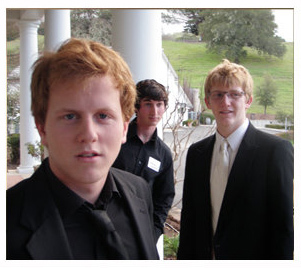 The young men invited all their family friends to a beautiful winery in California’s Alexander Valley. The Robert Young Estate Winery was kind enough to allow the boys to use their main mansion for the evening. 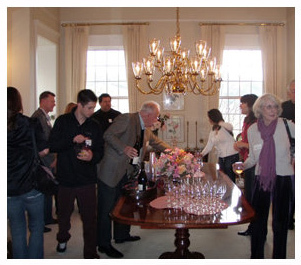 The boys hosted around seventy friends as they enjoyed appetizers and wine tasting. To wrap up the night the great grandson of Robert Young, Campbell Kelley, gave a speech talking about his experience in Haiti only a month before. Campbell had been on a relief mission comprised of several ACF volunteers inspecting orphanages and schools. By the night’s close the boys were able to raise several thousand dollars. A job well done! Remember, you too can throw your own fundraiser which benefits Aid For Abused Children Inc. and it doesn’t have to be as extravagant as a wine taster. In the past the boys have thrown BBQ parties asking for donations at the end, sold t-shirts with proceeds going towards ACF and all sorts of other creative ideas. Remember, even the littlest bit helps!